NASA's Phoenix Mars Lander is poised to deposit a soil sample into one of its ovens, where samples are heated to determine their chemical composition. SETI scientistsand astrobiologists share a common challenge: they are limited in the amount ofobservational data they can gather to test their theories. SETI researchersare separated from potential interlocutors by the vast distances between stars.Geologists studying other planets and moons within our solar system face asimilar challenge, exploring other worlds through the proxy of spacecraft. But evenwhen we can go to other worlds, the amount of information we can gather isseriously limited. The wildly successful MarsExploration Rovers have each covered only a few miles of terrain in overfour years of travel on Mars, amounting to a tiny fraction of the planet?ssurface. Consequently, conclusions built on observations at these locationsshould be extrapolated to other regions with caution. A vividreminder of the limitations of such ?local knowledge? 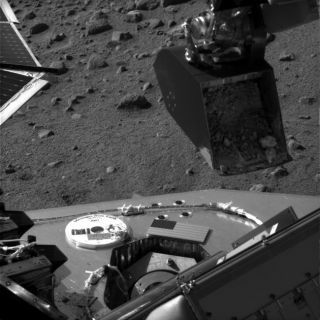 comes from NASA?s PhoenixMars Lander, now exploring the North Plains of Mars, an arctic region withunique conditions. Early in the Phoenix mission, scientists encounteredunexpected challenges in analyzing soil samples at this polar landing site,where soil ?clumps? so readily it?s difficult to get into the ovens designed toanalyze the soil?s chemical composition. Based on previously availableobservations, there was no hint that arctic soil on Mars wouldbe ?clingy.? As we movefrom understanding extraterrestrial geology to understanding extraterrestrialcultures, additional challenges arise. By the nature of the instrumentation weuse to process signals during SETI observations, we may well be able to detectdistinctly artificial signals without being able to extract anyinformation-rich messages embedded within the signals. We could know thatextraterrestrials are out there, but have no direct way of knowing much aboutthem. In a sense,we are faced with challenges akin to those of anthropologists who reconstructextinct species from fragmentary evidence. Like SETI scientists,anthropologists are looking for evidence of other forms of intelligence, and inthe best case scenario, they have only a fraction of the observational datathey would like. What lessons mightSETI scientists learn from them? Considerfor a moment the challenges anthropologists faced in reconstructing Homoneanderthalis, first discovered near D?sseldorf, Germany, in 1856. By theearly twentieth century, it was widely held that these now extinct hominidswere brutish in form. For example, in 1924 G. Elliot Smith described an?uncouth and repellant Neanderthal man? in his book The Evolution of Man:?His short, thick-set, and coarsely built body was carried in a half-stoopingslouch upon short, powerful, and half-flexed legs of peculiarly ungracefulform.? A few yearsearlier, Henry Fairfield Osborn included illustrations of stooped Neanderthalsin various editions of his book Men of the Old Stone Age, where he saidthat Neanderthals had ?knees habitually bent forward without the power ofstraightening the joint or of standing fully erect,? and that their hands weredeficient in fine motor control, lacking ?the delicate play between the thumband fingers characteristic of modern races.? ?Neanderthal man is commonly pictured as but incompletelyerect; as an almost hunchbacked creature with head thrust forward, kneeshabitually bent?. According to this view, he was a thoroughly unattractivefellow who was but imperfectly adapted to the upright, bipedal posture andlocomotion characteristics of the modern type of man.? There?sonly one problem. Anthropologists now believe Neanderthals walked upright. The turningpoint came with the article by Straus and Cave just noted. After citing all ofthe same passages mentioned above that characterize Neanderthals as stooped,they made the compelling case that this stereotype was based on excessiveemphasis on one particular Neanderthal. ANeanderthal who just happened to have arthritis. Central tothis image of Neanderthal as brutish savage was the reconstruction of oneespecially complete skeleton, found in La Chapelle-aux-Saints, by Frenchanatomist Marcellin Boule. Why did this particular skeleton play such adominant role in determining our image of Neanderthals, when there were manyother remains discovered elsewhere? Theskeletal remains from La Chapelle-aux-Saints, it turns out, included a goodsampling of vertebrae?bones essential to reconstructing a hominid?s posture.Given the interest in understanding the gait of early hominids, Boule?s specimenwas a logical starting point. And whilethe Neanderthal from La Chapelle-aux-Saints may have had the stoopedposture characteristic of a modern day human with arthritis, other Neanderthalsdidn?t. Moreover, the La Chapelle-aux-Saints Neanderthal didn?t look like theNeanderthals in Osborn?s book. Rather, Straus and Cave argued, ?if he could bereincarnated and placed in a New York subway -provided that he were bathed,shaved, and dressed in modern clothing - it is doubtful whether he wouldattract any more attention than some of its other denizens.? Compoundingthe fact that this particular Neanderthal had arthritis, Straus and Cavecontended, was the widespread presupposition that Neanderthals were ancestralto all later hominids, rather than an independent line. Consequently, it wouldbe natural to attribute them with more ape-like characteristics - a trap thatmany anthropologists fell into. Whatlessons can SETI researchers gain from the reconstruction of Neanderthal posture? First,whether sampling Martian soil or analyzing Neanderthal bones, the conclusionswe draw will depend on the observational data we have available. If we find acivilization on a planet circling a sun-like star, should we expect that itrepresents a typical extraterrestrial civilization? I thinknot. Rather, we should anticipate that this particular observation - thisparticular civilization - is influenced by a panoply of biological, cultural,and historical factors that we will only be able to sort out over a long time,if ever. Finally,recall that early anthropologists were influenced in their reconstructions ofNeanderthals by their presupposition that Neanderthals represented a phase ofdevelopment in the evolution of Homo sapiens. So too should we becareful to guard against imposing our own presuppositions onto extraterrestrialcivilizations, making our images of extraterrestrials not so much reflectionsof their true nature, but rather mirrors of our assumptions. Douglas A. Vakoch is Director of Interstellar MessageComposition at the SETI Institute and an Associate Professor of ClinicalPsychology, California Institute of Integral Studies.